One of my favorite Windows 7 amenities is thumbnail previews, which appear when you mouse over any running program in the taskbar. In fact, each thumbnail has a little red X in the upper-right corner, meaning you can close that program without first having to maximize it. iTunes takes this a step further by adding player controls. As you can see in the screenshot below, the thumbnail sports three little icons: previous track, play/pause, and next track. These buttons work just like the controls in iTunes proper, but they save you from having to actually switch to the program whenever you want to, say, skip to the next song or temporarily pause playback. 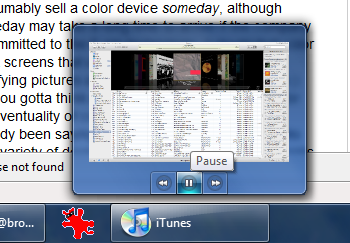 Of course, savvy users know that you can add an entire iTunes toolbar to the taskbar in both Windows 7 and Vista, but that just adds clutter. Here you get basic playback controls without consuming extra space. Nice!